The origins of Güllü’s family are rooted in the Elbistan village of Maraş, but due to political persecution they were forced to migrate to Malatya. Therefore, she was born on March 1972, in Doğanşehir (Malatya). She finished primary school there, but being Alevi and Kurdish her family experienced heavy discrimination and in 1985 and was forced to move to Trabzon, in the Black Sea region. Experiencing further discrimination, in 1992 her family migrated to Istanbul. In 1996 she became involved as an actress in Teatra Jiyana Nû (New Life Theater), a theatre company in Kurd’s mother tongue, at the Mesopotamia Culture Center. Despite many difficulties and struggle due to the political pressure, Güllü continued to work there to keep Kurdish culture until 2008. Then she moved to the Diyarbakir Metropolitan Theater, where she pursued her artistic career, as well as her political engagement. She subsequently joined in international many theatre festivals, and started a career as a film actress – e.g she assumed a role in the sitcom ‘Ref’ (Sterk Tv). Most recently, she received the Best Supporting Actress award for her role in the film “Babamın Kanatları” (Wings of my father) at the Antakya International Altın Defne Film festival. She also did Kurdish language dubbing for children’s cartoon programs on Zarok Tv. 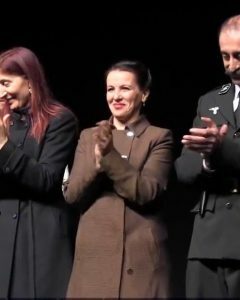 In December 2016 a Turkish government trustee appointed to the Diyarbakir municipal government and fired Güllü from the Diyarbakir Metropolitan Theatre, after her involvement in Kurdish language theater. Since 2017 she works at Amed City Theater.